View of “Christopher Chiappa: Compositions,” 2018. Defamiliarization is the engine that drives Christopher Chiappa’s art. Most of the sculptures here feel like coffee tables and nightstands, but from a realm a bit more fucked up and magical. Wooden legs, slinking up and around in myriad directions, feel poured rather than carved. His pieces are direct descendants of De Stijl, Constructivism, or Suprematism, but funnier—serious angles and reverential lines get tweaked into preposterous, quasi-utilitarian objects with a color palette straight out of a Skittles factory. 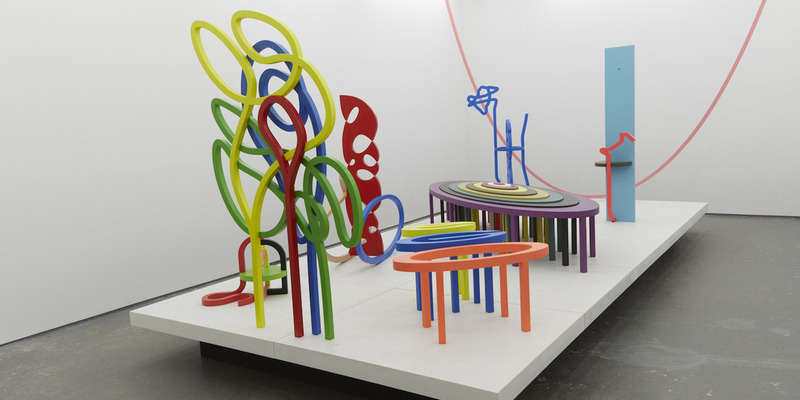 In the second room of the gallery, the notion of furniture falls away as the sculptures get stranger. Composition #54 (all works cited, 2018) stands like a Brice Marden in the round, an endlessly charming object that’s really a true feat of craftsmanship. One nesting table, Composition #43, is un-nested to spell out the word “ego,” while Composition #55, a long, curved strip of pink wood, is suspended from the ceiling. It dangles only millimeters above a plinth, as if to recall the tension between the fingers of Michelangelo’s God and Adam in the Sistine Chapel—or Steven Spielberg’s E.T. and Elliott. Like Morandi with his bottles, Chiappa rejoices in his obsessions. Let’s not forget his 2015 exhibition at this gallery, “Livestrong,” in which he displayed seven thousand hyperreal reproductions of sunny-side-up eggs, or the single Weber Grill sculpture he’s been working on for thirteen years and counting. When all is said and done, the work is quite moving. It exists in that tender spot where you know what you’re looking at but you don’t know why.